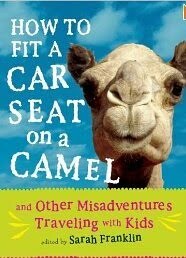 A while back, I mentioned I was making my way through How to Fit a Car Seat on Camel: And Other Misadventures Traveling with Kids, and my first impression was a positive one. Well, I ended up zipping through it, and really have to say, I enjoyed it immensely. I had laughs on par with that of Bill Bryson's travel books -- which are among the best books I've ever read. The book is actually a collection of short stories, each one relating some family's adventure and the trials and tribulations that go along with it. Most are hilarious, some are touching, most make you thankful you weren't along for the actual trip. One could argue pretty convincingly, that this book should be among the top 5 Must Have Items* if you travel with kids (this goes for grandparents, uncles, aunts, foster parents, etc.). Its value? Besides pure entertainment, it gives you the wonderful gift of Perspective. Pick it up before your next trip, and I've got imagine you'll look at your journey through a different lens. If nothing else, you'll get in some wonderful laughs.